Secondary home heating from a new inexpensive, simple and reliable Conservatory Solar Space Heating system (CSSH) costs 10 to 100 times less per kilo Watt Hour (kWh) than from conventional home heating. 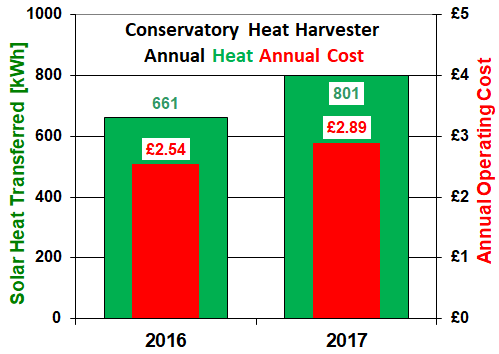 The heat is free, the cost to transfer it very small, by using a Conservatory Heat Harvester you can reduce heating cost. 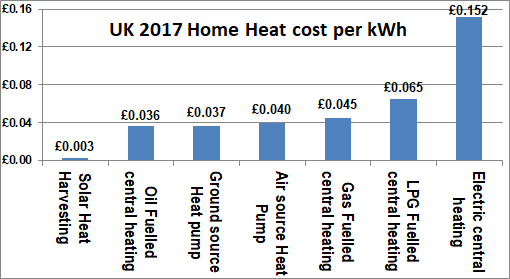 This chart shows the 2017 cost per kWh, a standard unit of heat, for a range of common Home Heating systems and the cost from Solar Space Heating CSSH and ASSH systems. The parts cost for the system was some £300. You can reduce heating costs by using a system that has a low cost per kWh. 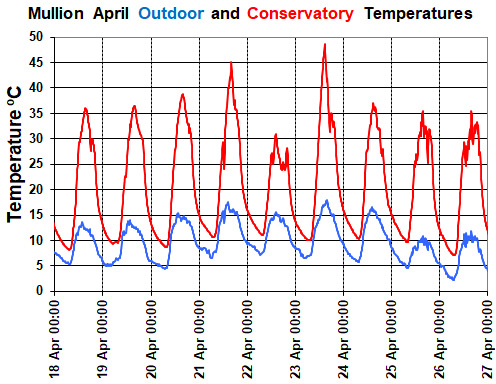 The picture above shows the Mullion home rear and conservatory, the chart shows conservatory and outdoor temperatures at a Mullion, Cornwall 1992 built	home, for 9 days in April. The maximum conservatory air temperature exceeded 20°C, a comfortable home temperature, by from 5°C to 25°C for more than 8 hours every day showing that much free solar heat is available. In late 2015 a secondary home space heating system was retro-fitted to a Mullion, Cornwall ground floor conservatory to replace some of the expensive heat from the current oil fired central heating system to reduce heating costs, and to increase comfort levels by reducing high conservatory air temperatures. At times of the year when Solar Space Heating cannot be used e.g. winter months, the home's normal heating system is used. The system custom Attic Heat Harvester Controller continually monitors the temperatures high in the conservatory and in the home. When the home temperature is below a user pre-set maximum, and the conservatory air temperature is sufficiently high, the controller turns on a quiet efficient brushless motor driven fan. 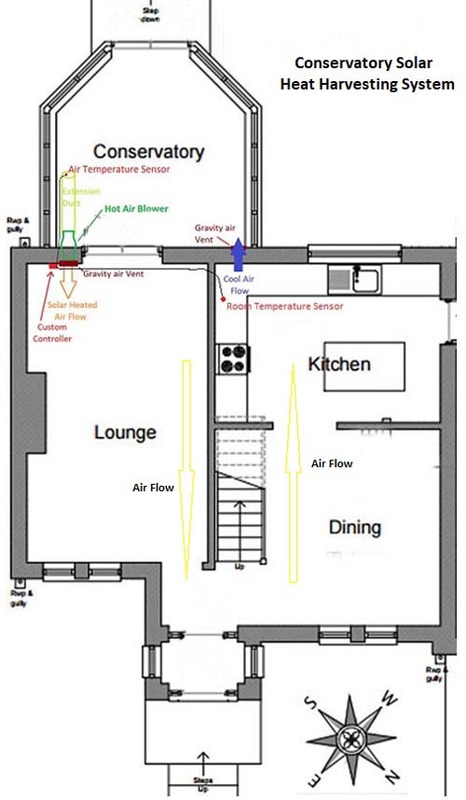 The air circulates through the home and returns to the conservatory at a low level. Gravity closed air vents prohibit air movement between the conservatory and the home when the fan is not operating. The controller calculates and records system performance parameters, which can be viewed on its integrated display. Parameters saved include: current transferred heat and efficiency, total transferred heat and efficiency, total annual operating cost, blower hours, average temperature difference, and the maximum and minimum conservatory temperature. The controller has a number of user settable parameters enabling system performance to be adjusted. 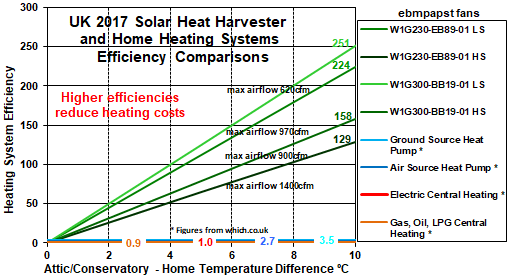 The two charts below show Conservatory Solar Space Heating efficiency and airflow rates for four different recently available energy efficient fans of different sizes an maximum airflow rates suitable for a range of different home and conservatory size, operated at both low (LS) and high speeds (HS), together with the efficiency of common home heating systems. The fan initally fitted in 2018 to the Mullion home is a W1G200-EC87-25 which is connected to operate at high speed. 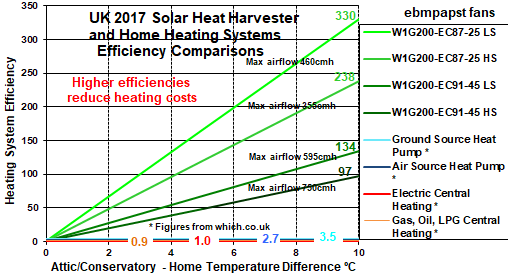 The Conservatory Solar Space Heating system efficiency is proportional to: a) the airflow rate the fan achieves b) the fan power consumption and c) the conservatory – home temperature difference as shown in the charts below. At an air temperature difference of just 0.5°c our Solar Space Heating system that uses hot conservatory air efficiency exceeds all others. In the system 2016 and 2017 performance charts below which used a far less energy efficient fan, the average air temperature difference was 9°c achieving an efficiency of 40. 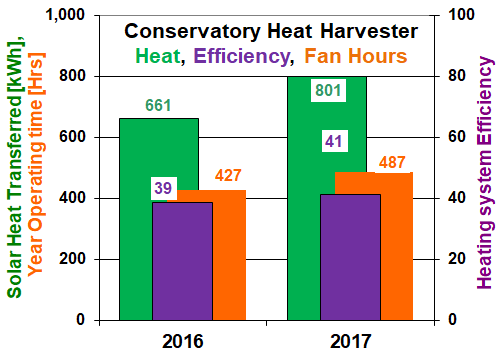 The following charts show Mullion Conservatory Heat Harvesting System 2016 and 2017 annual performance and 2017 monthly performance. In 2016 the system provided 661kWh of heat at a total cost of £2.54. In 2017 the system provided 801kWh of heat to the home at a total cost of £2.89. In 2018 the system provided almost 1,100kWh at a cost of £3.00 as a result of things done to maximise conservatory space heating. Both annual and monthly performance are weather dependant. 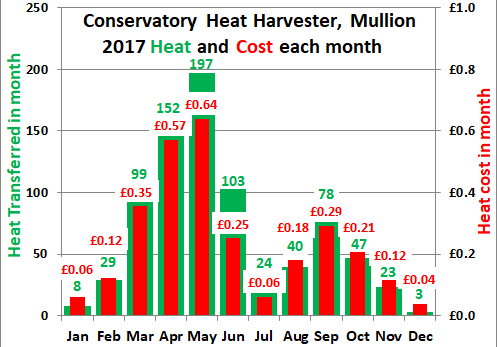 At Mullion, generally most heat is transferred in the spring and autumn, and in June, July and August little heat is required as shown in the following charts. The Mullion weather in 2017 was somewhat unusual, the spring weather was good, but autumn weather was unusually cool, however the automatic Conservatory Heat Harvesting system makes the most of any weather only transferring hot conservatory air when it is both required and available. The surprising high efficiency of Solar Space Heating systems that use hot conservatory air results from the thermodynamics equation for Heat in Hot Air and to the very low energy required to transfer the air due to the high efficiency of the brushless DC electric fan motor used. 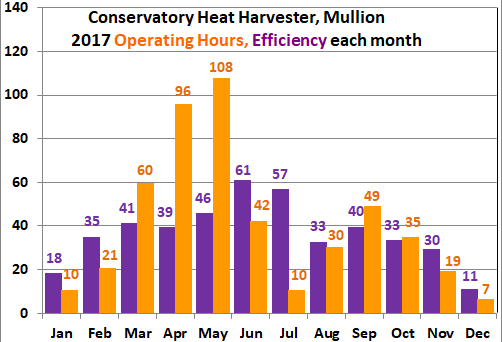 The Mullion home comfort levels early and late in the year were increased because hot conservatory temperatures were decreased in early spring and late autumn when the solar heated air was being transferred by the solar heat harvesting system to warm the home. During the months when the oil fired central heating was turned off home temperatures were increased to the maximum value preset by the user in the controller during cooler weather spells. Fossil fuels in our world are being depleted at a very alarming and unsustainable rate. By using Solar Home Space heating using hot conservatory air in your home you can reduce your fossil fuel use and your current home heating system use and the associated costs by £10's to £100's every year.